Brackley Town boss Kevin Wilkin will be looking for his side to take maximum points when they entertain lowly Guisley on Saturday. Saints remain third, two points ahead of Bradford Park Avenue, in Vanarama National League North despite being unable to make it seven wins on the spin at Southport last weekend. 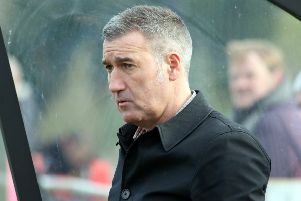 Wilkin knows Saints will be expected to take all three points against Guisley but it mindful that his side lost there earlier in the campaign. 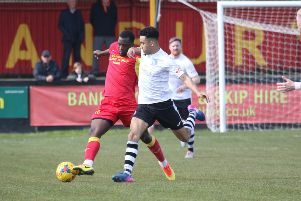 Looking back on Saturday’ stalemate at Southport, Wilkin said: “A draw was probably a fair result but it was an awful game and I wouldn’t have wanted to have paid to watch it. The pitch was bone hard and didn’t lend itself to good football, which didn’t help our game. “They were very direct and we didn’t have a lot of possession because it was difficult to pass it on that pitch. The positive from it was that we were able to mix it up when we needed to in order to get a result. “The players dug in when they needed to, Southport loaded a lot of balls directly into the box which we had to defend well. It wasn’t the way we want to play and probably suited Southport more than us.